WASHINGTON (Reuters) - U.S. Supreme Court Justice Ruth Bader Ginsburg was hospitalized on Thursday after she fell in her office at the court the night before, fracturing three ribs, a court spokeswoman said. The court's 5-4 conservative majority was restored last month when the U.S. Senate confirmed Republican President Donald Trump's appointee Brett Kavanaugh after a contentious nomination process in which Kavanaugh denied a sexual assault allegation dating to the 1980s. 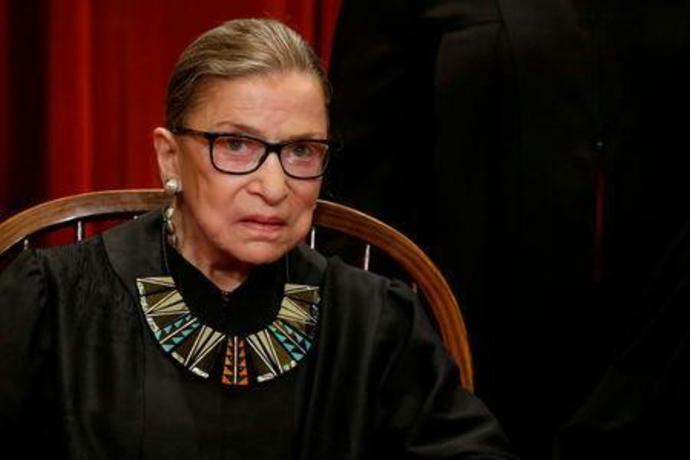 As the oldest justice, Ginsburg is closely watched for any signs of deteriorating health. She has survived bouts with cancer and undergoes regular medical checkups. This week's incident was not the first time Ginsburg has suffered an injury as a result of a fall - in June 2012, she fell at home and cracked two ribs. Kavanaugh's nomination hearings were rocked by university professor Christine Blasey Ford's allegations that he sexually assaulted her in 1982, when they were both high school students. Ginsburg, who made her name as an advocate for women's rights, voiced support for the #MeToo movement against sexual misconduct even as Kavanaugh was about to face a Senate hearing on the allegations against him, saying that unlike in her youth, "women nowadays are not silent about bad behavior." She later said she regretted making the comments, saying "judges should avoid commenting on a candidate for public office." Kavanaugh's Senate confirmation process convulsed the nation just weeks before Tuesday's congressional elections in which Trump's fellow Republicans lost control of the U.S. House of Representatives but built on their majority in Senate, which has sole authority over judicial and Supreme Court nominations. "By expanding the Senate majority, the voters have also clearly rebuked the Senate Democrats for their handling of the Kavanaugh hearings," he said. If he were able to make a third nomination to the court to replace Ginsburg, that would increase the conservative majority to 6-3. The court's other liberal justices are Stephen Breyer, Elena Kagan and Sonia Sotomayor.